The Supreme Court of Canada's recent ruling that administrative monetary penalties do not offend constitutional rights will likely have a “chilling” effect on tax advisers, Toronto tax litigation lawyer Peter Aprile tells Legal Feeds. As the article notes, Guindon v. Canada dealt with adviser penalties assessed against lawyer Julie Guindon under s. 163.2 of the Income Tax Act. 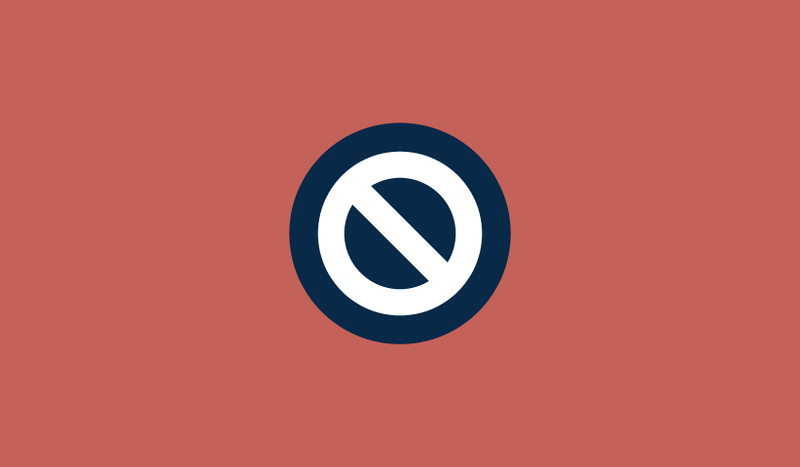 The section imposes penalties on anyone who makes false statements that could be used by another person for the purpose of the act. In 2001, Guindon gave a legal opinion about the Global Trust Charitable Donation Program, but, as the decision says, she had not reviewed the supporting documents. She contended that the matter should not have proceeded in the Tax Court of Canada and that the penalty should be vacated. She was successful in the Tax Court, but the Federal Court of Appeal set that decision aside. However, the SCC ruled last week that proceedings under s. 163.2 are of an administrative nature, rather than criminal — which means Guindon must now pay the assessed penalties. Aprile, principal of Counter Tax Lawyers, tells Legal Feeds that it was interesting to listen to the statements the CRA was making at various accounting conferences as the case moved through the Tax Court, and then the Federal Court of Appeal. “We know the CRA wanted to get the word out there about the possibility of substantial fines being levied in the civil context without having to cross over to criminal prosecution,” he says. 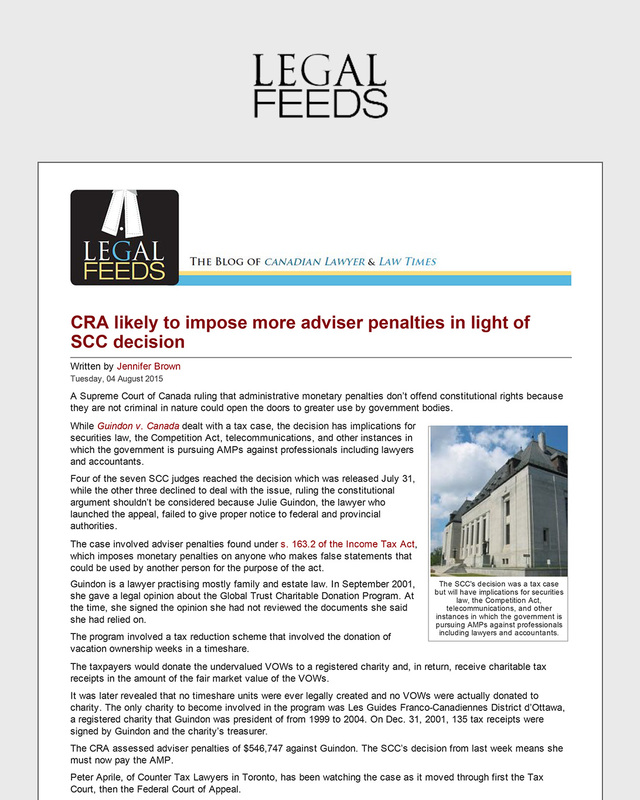 Counter Tax Lawyers filed an access to information request just before the Federal Court of Appeal released its decision, the article reports, in order to determine how many penalties the CRA had issued. In March 2013, Aprile's access to information request revealed the CRA had issued 77 s. 163.2 penalties to tax preparers, planners, and promoters totalling approximately $119.5 million. There were 47 ongoing audits and 14 of those involved tax preparers and 33 were tax promoters. “As at April 11, 2014, the CRA approved 93 proposals to assess the penalty and chose not to issue assessments related to 21 s. 163.2 penalties. As at May 2011, 19 promoters and 27 tax preparers had been assessed $65.5 million, and audits of 52 promoters and 23 preparers were underway. No penalties had been reversed at the objection stage,” according to the access to information request, Legal Feeds reports. Between 2000 and 2007, says the article, the CRA had only issued nine assessments. Between the Federal Court of Appeal decision and the SCC decision in Guindon, the numbers jumped to $137 million in penalties, and all assessments were stuck at the objection level. As the 2014 Auditor's General report indicates, the median penalty issued is $440,000. This data shows that two things are happening, Aprile says in the article. “The CRA has held every other one in abeyance pending resolution of Guindon, and so we will start seeing those move through the courts. And it’s obvious with the Federal Court of Appeal decision, the CRA gained some confidence it would stand the test of the Supreme Court. Aprile says he has little doubt there will be greater imposition of these penalties, as well as more activity in the court "to determine what rises to the level of culpable conduct and what an appropriate due diligence defence will look like.